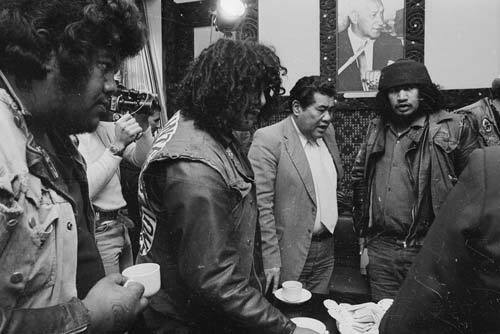 Politician Matiu Rata is seen here at a summit meeting with gang leaders in 1981. He was described by his former parliamentary colleague Sir Geoffrey Palmer as the catalyst behind the modern Māori renaissance. As minister of Māori affairs, Rata set up the Waitangi Tribunal. Later he left the Labour Party to form Mana Motuhake, the first modern Māori political party.